Recently moved into a Lake-view condo? Counting on years of direct unobstructed sunlight? Think again. 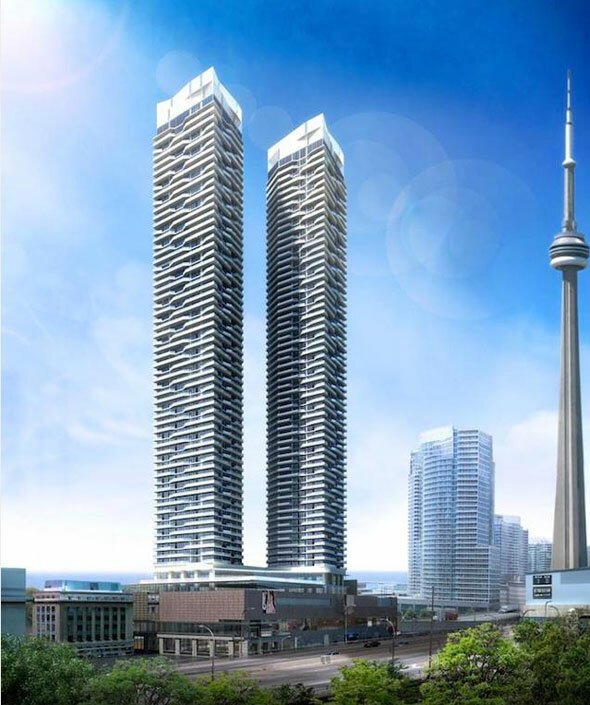 In the next few years Harbour Plaza Residences, which is no less than a small town in the sky, will rise a whopping 69 and 65 storeys above the shores of Lake Ontario. The design of these twin megaliths diverts a bit from the standard green glass box ethos of the surrounding south core area, and gets a tad playful with its balcony design. Under development alongside a predictably boxy 37 storey office tower at 1 York, these two towers will feature direct access to the ever growing PATH system. This feature might work quite well for employees at the nearby office buildings who aren't interested in sharing their sidewalk space with hoards of sweaty summer tourists. 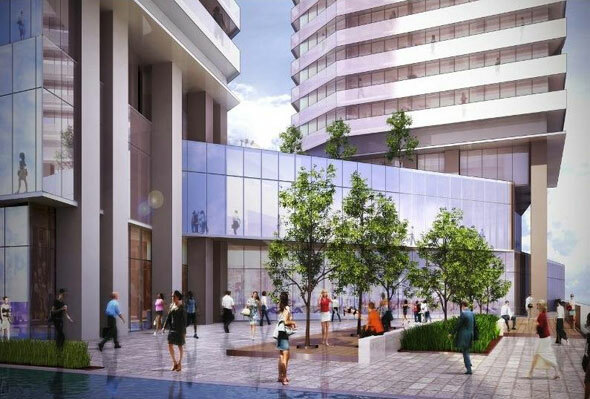 Harbour Plaza promises to be especially suited well for regular Island goers and people interested in having an unobstructed lake view (at least for now!). In the colder months of the year when this neighbourhood turns into a very windy winter wonderland there is a whole host of indoor amenities to keep residents occupied. These include a Juice Bar, Sauna, Spinning Room, a Theatre lounge and a Party Room (where fun is officially sanctioned). Moreover, for those who are still a bit skeptical about the health consequences of swimming in the lake (I.e. extra limbs or gills), there is also a nice indoor pool area. 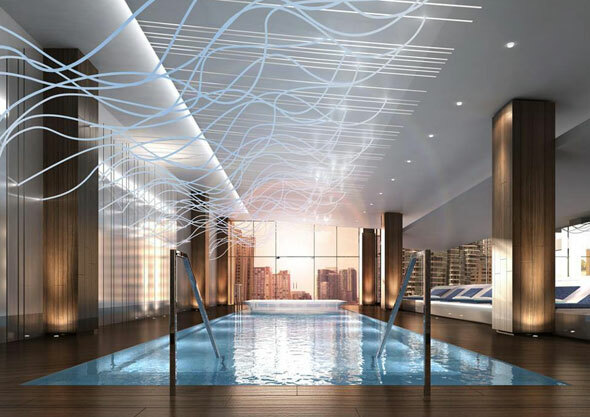 Although after taking a look at the renderings, it may not be advisable to do any major jumps into the pool, lest one become entangled in the very unusual light fixture above. Amenities/building features: Weight studio, kinesis studio, cardio studio, pilates/yoga studio and spinning room, serene indoor pool with water feature, poolside lounge, juice bar, steam rooms, treatment rooms, business centre, outdoor terrace, games room, party room, fireplace lounge, theatre lounge, look out lounge, indoor green space with lounge seating and reflecting pool, outdoor BBQ and dining area, and outdoor stonewall fireplace lounge. People who want to have a huge amount of green space available to them without needing to maintain it, people working in the nearby area, and Investors looking for a condo that will keep its value a great deal longer than the surrounding buildings. As far as locations go it doesn't get much more central than this. When it comes to connectivity in this area there is still much to be desired, but along with the nearby Union Station expansion, the various streetcars that take the Harbourfront route and the PATH connections, things certainly could be worse. You are looking for an area with a decent amount of locally owned shops or restaurants, you are not interested in living in a complex with thousands of others, you don't really dig the idea of living so close to the Gardiner, or you just hate lakes! This area is truly an experiment in neighbourhood creation, formerly a series of surface parking lots and scattered industrial sites the past ten years has seen it grow exponentially into density that may soon rival the Financial District, but given it's relatively young age there is some risk as to how it might turn out. Along with a few others like Ice Condos, this is probably one of the better buildings in the area, but you are still going to have to wait a few years for this condo wasteland to come into its own as a culturally vibrant neighbourhood.